A very unique four-knob pedal designed to overdrive already distorted amplifiers. Hand-made in Finland premium quality overdrive pedal. 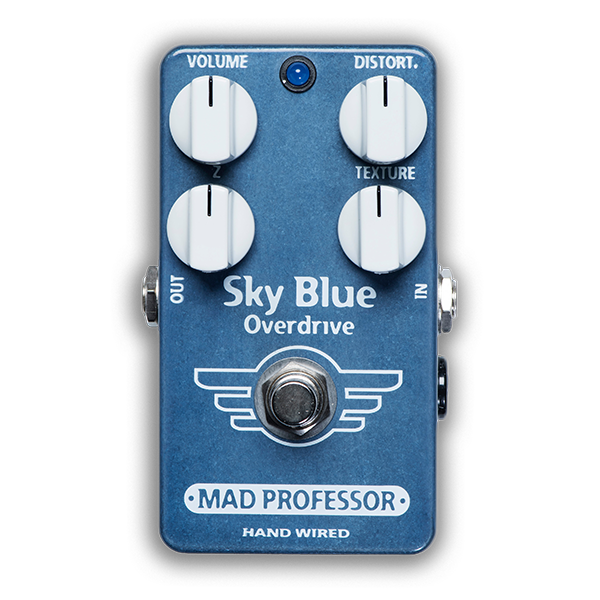 Mad Professor Sky Blue Overdrive (SBOD) is a very unique four knob pedal designed to overdrive already distorted amplifiers as well as provide light overdrive or soft distortion on clean sounds. Special feature on this pedal is that you can adjust the feel and dynamics with Texture and Z knobs. The Texture allows changing how and when circuit distorts as well as adjusting overall EQ. The Z is a control that creates an adjustable load to the instrument connected to the SBOD input. With standard passive pickup loaded guitars dialing this control will adjust the upper resonant peak of the pickups. It also affects the taper of the volume control on the guitar, adjusting how the tone cleans up when using the guitar volume knob. Like all Hand Wired MP pedals, SBOD is hand made in Finland using only premium components, to give years of trouble free operation with superb musical tone.